Fort Wayne’s Voices of Unity traveled to New York City over the second half of last week to partake in a number of exciting events that culminated in an impressive performance at the world renowned Carnegie Hall. The students, most of whom had never been to New York City, were able to expand their horizons and also experience a Broadway show, perform at the well-known Harlem Children’s Zone, and see many cultural landmarks including the Statue of Liberty and Ellis Island. 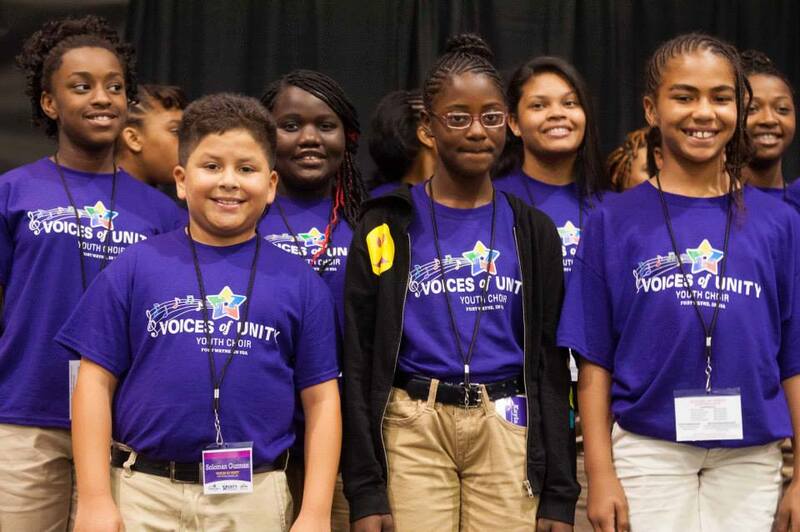 The Voices of Unity Youth Choir was invited by Choirs of America (COA) to participate in COA’s American Musical Performance that included other nationally recognized youth choirs – over 600 individual singers. The main event allowed the choirs to collaborate and sing multiple songs in five different languages; selected choirs that had 40 or more singers were given the opportunity to spotlight a song from their repertoire. Dressed in their best and most formal attire the Voices of Unity Youth Choir made history at a once-in-a-lifetime performance at Carnegie Hall. The choir felt more than prepared as they rigorously rehearsed and practiced for months ahead of this performance. With family members, choir teams, and fans in the audience, the doors opened for the choir to enter the beautiful and majestic auditorium. They shared a set with the other sensational choirs that included songs in different languages. The climactic moment came when the choir performed Director Marshall White’s rendition of “What a Wonderful World.” The theatre soon filled with the beautiful voices of the Fort Wayne native choir and delivered the tune as is expected of World Champions. The New York City audience and members of the other choirs were impressed. Commenting on the performance, Grammy Award-nominated recording artist Grant Gershon simply said, “Wow!” and applause ensued. The choir members all had one word to describe the experience: amazing. “This means a lot to the choir. We’re making history,” said one member. “We’re putting Fort Wayne and Voices of Unity on the map,” commented another choir member. Before the climactic performance at Carnegie on Saturday, the youth choir had the opportunity to perform for the world renowned social activist Dr. Geoffrey Canada, the president and chief executive officer of Harlem Children’s Zone (HCZ) and one of TIME’s 100 most influential people. The Harlem Children’s Zone was holding a celebration in his honor for the influence and success he has had in the Harlem community. The Indiana youth choir impressed the New York City crowd at HCZ by performing beautiful pieces including “America the Beautiful,” “What a Wonderful World,” and “In the Sanctuary.” They also sang a version of Michael Jackson’s “I’ll Be There,” and Whitney Houston’s “One Moment in Time.” The choir received a standing ovation from the crowd that included Dr. Canada and his family. Following the performance at HCZ, the choir experienced Broadway for the first time with a chance to see The Lion King. To top off the night, they sang an impromptu performance in the lobby to an international audience, and to some of The Lion King cast members after the show. Many pulled out their smartphones and cameras to capture the unified voices of the youth choir. Later in the week, they visited Queens College where they partook in Choirs of America musical workshops from well-renowned composers and professors that included Dr. Andre Thomas, Dr. Bryce Pinkham, and Dr. Rollo Dilworth. The choir was also able to rehearse with the other participating youth choirs as they prepared for the big performance at Carnegie Hall the following day. The New York trip, which included a Broadway show, college workshops, and a capstone performance at Carnegie Hall, all happened due to the generous support of Fort Wayne donors who donated to the Gold for the City campaign. The students, parents, and staff are thankful for the emotional and financial support the Fort Wayne community has given. You can support and learn more about the Gold for the City campaign at UPAF.com. Through discipline, dedication, and motivation the Voices of Unity Choir represented Fort Wayne, IN in a tremendous way and stole the hearts of those who experienced them for the first time. They will not stop at Carnegie Hall or New York City, but will represent Fort Wayne at the 2014 World Games in Riga, Latvia and bring home another gold medal.